Community Facilities Act of 1982 was created to provide an alternate method of financing needed improvements and services. What is Mello-Roos? It is actually a “nickname” that the Community Facilities Act of 1982 is commonly known by. 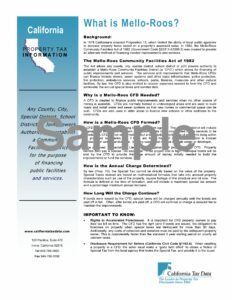 The Community Facilities Act was a law enacted by the California State Legislature in 1982. The name Mello-Roos is derived from its co-authors, Senator Henry J. Mello (D-Watsonville) and Assemblyman Mike Roos (D-Los Angeles). When Proposition 13 passed in California in 1978, it limited the property tax rate and the ability of local governments to increase the assessed value of real property by not more than an annual inflation factor. As a result, the budget for public services and for the construction of public facilities could not continue unabated. New ways to fund local public improvements and services were considered and adopted by the California State Legislature. A Mello-Roos tax is a species of parcel tax that circumvents Proposition 13 (which limits property taxes based on the assessed value of real property) because it is not levied on the assessed value of real property. What is a Mello Roos District? A Mello Roos District is an area where a special property tax on real estate, in addition to the normal property tax, is imposed on those real property owners within a specific area. This defined area is called a a Community Facilities District (CFD). A Mello-Roos Community Facilities Districts raise money through special taxes that must be approved by 2/3rds of the voters within the district. A CFD is formed to finance major improvements and services within the district which might include schools, roads, libraries, police and fire protection services, or ambulance services. The taxes are secured by a continuing lien and are levied annually against property within the district. Find if the home you are looking at to buy has Mello Roos! To quickly look up Mello Roos in the counties of Sacramento,El Dorado and Placer, use the convenient “Quick Search Mello Roos” links below, click on your desired county, and simply have the property APN# ready. Most home Buyers are interested in knowing if a home or neighborhood possesses Mello Roos. One may be asking, “how do I find out if a property is subject to Mello Roos?” Or, “how do I search if a neighborhood has Mello Roos?” The reason these questions are so important is because Mello Roos does add expense to your property taxes if a property is subject to Mello Roos. Sometimes a substantial amount. A home Buyer must weigh the benefits of the extra Mello Roos expense against the amenities provided for that neighborhood and compared to other neighborhoods or homes that may not have Mello Roos. Mello Roos may be an extra expense; however, sometimes those extra expenses are worth the cost considering the kind of neighborhood one would be able to live in. As long as you have the full address of the property or the Assessors Parcel Number (APN), which is listed on most Home buyers sites, you can find the Mello Roos Bill on any property using the “quick search” links above. Questions to ask about Mello Roos would be “how many bonds are there?” Sometimes there are more than one bond on a property. That means the property is in multiple districts Another question to ask about Mello Roos would be “how much is the Mello Roos bond?” Cost is by far the most important question to a home buyer or homeowner. Another great question to ask is “when does a Mello Roos bond expire?” Sometimes a Mello Roos bond does not have an expiration date if a neighborhood still has more building to do, or if no expiration date has been established. Therefore, it is possible for a Mello Roos bond to not have an expiration date. This entry was posted on Tuesday, May 23rd, 2017 at 8:23 am	and is filed under First Time Home Buyers, Home buying tips, Posts for Pages, Sacramento Real Estate. You can follow any responses to this entry through the RSS 2.0 feed. Both comments and pings are currently closed.